Goldilocks & Her Doodle: Milton Made the News! Our goldendoodle is a local celebrity! Yesterday Milton was featured on the Life section of the Dallas News website with his picture as the opening shot for a slideshow of photos on Rowlett's Pooch Plunge, a doggie splash day. 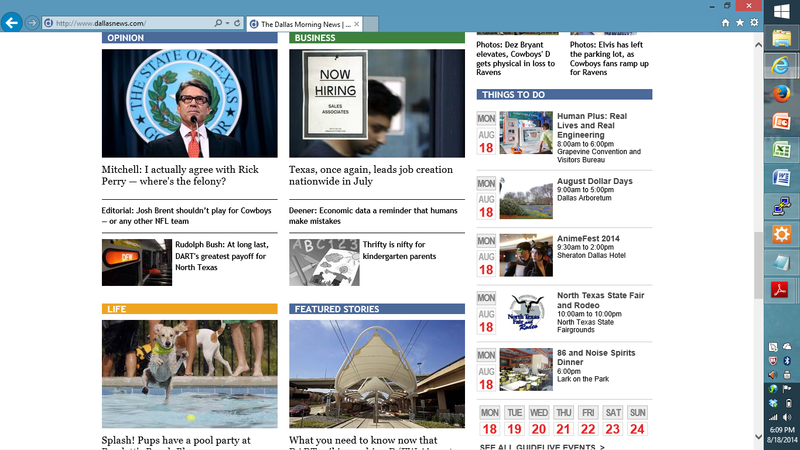 We took this screen shot because Milt was sharing web space with... Rick Perry of all people! Below are Milton's two hit pics, or you can view them directly here: "Splash! Pups Have a Pool Party at Rowlett's Pool Plunge". The funny part about these pictures is that as soon as we arrived at the splash day, a photographer honed in on Milt's jumping and started taking lots and lots of up close snapshots with a super long lens. When the photographer was done with his shots, he completely bypassed me, the mother, and went directly to Jeff to get the stats on Milt. Jeff was all too happy to provide his own name, only his, as Milton's owner, along with Milt's name and breed. Not once was there a mere mention of his wife, me, who was standing no less than five feet away. I guess Jeff just forgot about the mother of his dood when all that fame went to his head...! Jeff, Milt's got the talent; we're just his ride. Well, Milton the Goldendoodle has certainly surpassed his Momma in his celebrity status. I'm just fine with that though; being part of Milt's entourage is not too bad of a deal. He always manages to keep it real -- a couple of tennis balls and some water -- living the high life. Follow Milton on Instagram at Milton_the_goldendoodle.